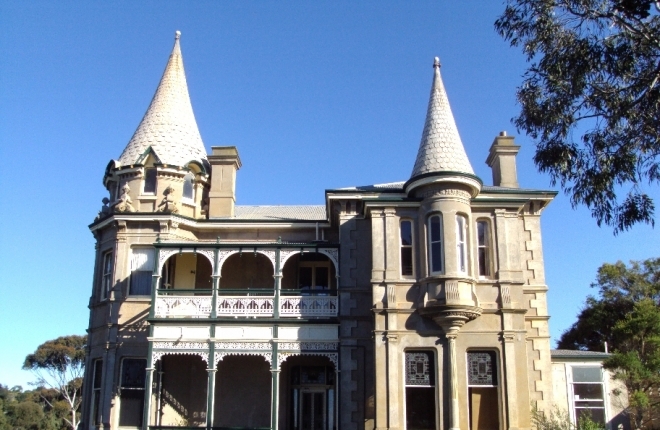 Adare House at Victor Harbor, 75 km south of Adelaide, is a grand home completed in 1893 now owned by the Uniting Church of Australia. It is located on the outskirts of the town along the banks of the Hindmarsh River, but with views to the ocean. For more than sixty years, Adare House has been used by the church for group camps and more recently, for private functions such as weddings. The grounds are used as a popular caravan park. The land was known to the Raminjeri people who inhabited the area as mootiparinga, meaning murky or brackish water. In the first year of colonial settlement, the site of Adare House was bought by South Australia’s first Governor, John Hindmarsh. His son, also John Hindmarsh, built a small home there in the 1860s. In 1889 the property was purchased by Daniel Henry Cudmore, a successful pastoralist in the boom decades of the 1870s and 1880s. Cudmore greatly extended the building to include nineteen rooms, a cellar, tower, balcony and three turrets. The rebuild incorporated an interesting blend of features from French castles alongside classic Victorian era iron lacework. It has been suggested that the design of Adare was inspired by a visit to Trossach’s Hotel in Scotland by Cudmore in 1890. Trossach’s Hotel was an early example of accommodation designed for nature-inspired tourism, in an area beloved of Queen Victoria and immortalised in Sir Walter Scott’s poem Lady of the Lake and later novel Rob Roy. Whatever its inspiration, Adare House, is an enchanting and unique landmark which took three years to complete. Frederick Dancker, the architect, is credited with introducing the turret roof to South Australia. His other work includes the beautiful Our Boys Institute with its Venetian Gothic façade on Wakefield Street in Adelaide, the Maccelesfied Institute and a number of church buildings. Today, Adare House is in urgent need of extensive conservation and restoration work to preserve the magnificent seaside mansion for future visitors to enjoy. The National Trust of South Australia, in conjunction with the Uniting Church, has established a conservation appeal to support this work. P. A. Howell, ‘Cudmore, Daniel Henry (Dan) (1844–1913)’, Australian Dictionary of Biography, National Centre of Biography, Australian National University, http://adb.anu.edu.au/biography/cudmore-daniel-henry-dan-270/text9913, published first in hardcopy 1981, accessed online 28 January 2016.